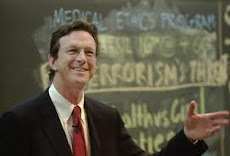 Musings on Michael Crichton: Happy Earth Day - Cool It! Happy Earth Day - Cool It! Crichton made it clear in his speeches, interviews, and the “Author’s Message” of State of Fear that he cared very much about the environment. In November 2005 I was fortunate enough to participate in a Barnes & Noble online discussion with Michael Crichton on his novel State of Fear. Crichton was asked: If you had a book club, what would it be reading -- and why? "Bjorn Lomborg's The Skeptical Environmentalist. It's one of the most important books of the last decade because it carefully details a new environmental agenda, which I think is vitally important." "Bjørn Lomborg is the best-informed and most humane advocate for environmental change in the world today. In contrast to other figures that promote a single issue while ignoring others, Lomborg views the globe as a whole, studies all the problems we face, ranks them, and determines how best, and in what order, we should address them." I received my copy two days ago. I'm going to watch it asap.